It was July, and we were heading north from BC’s Central Coast. We had planned to take Mathieson Channel that day, to explore the inlets of the Fiordland Recreational Area, which looked gorgeous in our cruising guidebooks. But we realized that the low ceiling of dense cloud, along with the heavy rain that was forecast, would eliminate any chance of seeing those sheer granite peaks and beautiful waterfalls for at least the next several days. That was more time than we could spare waiting for the skies to clear. If there’s one thing I’ve learned from a lifetime of travelling on boats, it’s that you have to be flexible about your routes and destinations. We decided instead to take Finlayson Channel, the most direct course to the North Coast. To get there we needed to go through Jackson Pass, a narrow dogleg that is safest at slack water (the brief time when the current changes direction and has very little speed). We’d missed high water slack that morning, but there was a low water slack in a couple of hours. So we dropped anchor in Rescue Bay, just east of Jackson Pass, to pass the time until then. I was disappointed to have to give Fiordland a miss – I knew we might never get back to that part of the coast so it may have been our only chance to see it. But relaxing over lunch, Fiordland no longer mattered. Rescue Bay was full of birds, and opened to a lovely, layered view even if partly obscured by clouds. No soaring peaks or waterfalls – only mirrored reflections of islands and reefs and gentle tones of blue. A quiet, subtle beauty: the perfect place to be on this monochromatic kind of day. If you’re on Gabriola Island: about a dozen of my marine-focused prints are on display at Gabriola’s popular Silva Bay Restaurant & Pub, now open for the season under new management. My photos will be there through the summer so I hope you’ll stop by for a meal and check them out. 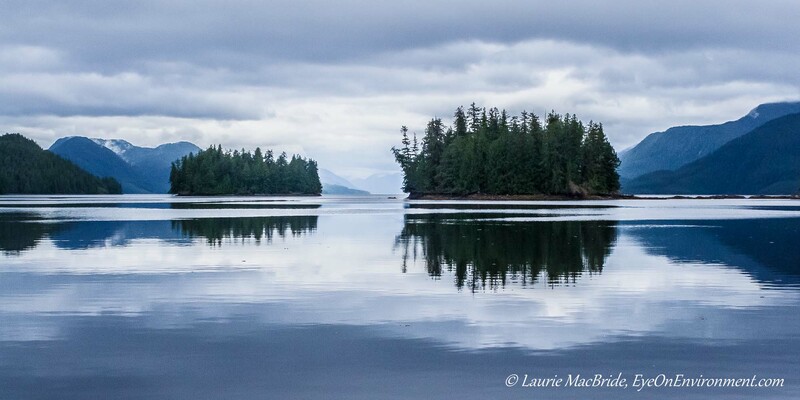 Posted by Laurie MacBride, Eye on Environment on May 10, 2015 in BC coast, Boating, Central & North Coast and tagged beauty, boating, Central Coast of BC, clouds, colours, Inside Passage, nature, photos, places, reflections, weather. I adore everything about this, Laurie. Fantastic work!